Edmonton: The saints had a very profitable week of ministry with P. Simms, and also enjoyed visits from G. Williams and B. Funston. Fort McMurray: J. Webb was with the assembly from March 1-8 with ministry on Revelation and shared twice in preaching the gospel. Bryan and Elizabeth Funston also visited, and our brother had three ministry meetings and shared in preaching the gospel. The last Saturday of the month the assembly held an afternoon of winter activities for the children, followed by a word in the gospel and a meal for children and adults. There were new children in attendance which was an encouragement. Vancouver: Please pray for gospel meetings to commence April 26 at Victoria Drive. 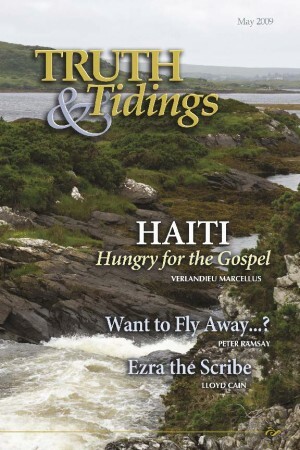 At the Monthly Missionary meeting in Carleton in April, Matt Scott gave a report of the January gospel outreach in Haiti where he was accompanied by Verlandieu and Rubin Marcellus from Camden, NJ. Brandon: The assembly, with Pete Smith and his P.B.S. material, had a very successful week at the Brandon Winter Fair. Several hundred Via magazines and materials were distributed. Shediac: The assembly deeply appreciated a visit from N. Burden in February. With the help of an interpreter, he spoke on the Bread of Life, the Living Bread, and the Bread of God from John 6. This was followed by two weeks of gospel meetings during which a ten-year-old boy from a visiting French family professed faith in Christ. Please pray for his parents and his two younger brothers still not saved. English Point: D. Booth finished two weeks of ministry meetings on March 6. The meetings were well-attended and enjoyed by the saints. On March 8, there was an all-day conference to conclude brother Booth’s visit and ministry was shared with local brethren. Sandringham: M. Derksen and R. Mcllwaine were with the assembly and had ministry on Saturday, March 7. The visit was very much appreciated by the saints. St. John’s: The believers were greatly encouraged with four weeks of gospel meetings with M. Derksen and R. McIlwaine. The meetings which concluded March 29 were well attended with a number of unsaved out each night. Two teenagers professed faith in Christ. Clementsvale: J. Procopio had four nights of appreciated ministry meetings with the assembly. These meetings were also supported by the believers from Weaver’s Settlement. Hubbard’s Point: A. Hull had a profitable and appreciated visit for eight nights using his gospel chart. Some were in attendance for the first time. Tatamagouche: Prayer is requested for gospel meetings commencing at the end of April with A. Hull and P. Ramsay. Weymouth: J. Meekin had well-attended Bible readings and all were much encouraged. Beachburg: M. Pratt requests prayer for this area that the Lord will definitely guide as to where the gospel tent should be erected for the summer season. Earlton: E. Fowler and M. Pratt finished five weeks of gospel meetings which were preceded by prayer meetings three nights a week for five weeks. There was rejoicing to see the good hand of God in salvation of both young and older persons. Mississauga: The Applewood Heights assembly finished a 2-week gospel effort with E. Higgins on his chart, Future Events. This is the first in their new location, and they were thrilled with the interest. The hall was filled each night with both neighbors and believers from surrounding assemblies. Many unsaved heard the gospel faithfully preached, and we are looking to God for lasting blessing. Oshawa: The assembly, along with visitors from surrounding assemblies, enjoyed the Saturday night winter ministry meetings. These meetings where taken by D. Booth, P. Glenney, U. Ussher, E. Badgley, F. Sona, and J. Jarvis. The assembly was also encouraged when a teenage brother was recently baptized. Many unsaved were present to hear the gospel preached by L. Steers. Gore Bay: The assembly here on Manitoulin Is. has become very small. There is an exercise to have gospel meetings with Brian Owen and Terry Hurd (Nipissing Jct.) August 2-23 with the hope of seeing some interest and encouragement. The meetings will be held at Britainville near Spring Bay in an old Methodist church building. In the mornings, from August 10-14, children’s meetings are planned in the Gospel Hall at Providence Bay. Any who are planning to vacation in August are encouraged to consider coming to support the meetings. Victoria Road: The saints have been encouraged and blessed by appreciated visits over the last several months from F. Krauss, E. Miller, L. Langfeld, B. Crawford, E. Badgley, A. Cook, and B. Snippe. Alpena: The assembly is happy to receive H. Rodriguez and family who are temporarily in the United States. Recently, a new meeting place has been opened in Huntsville, AR, for gospel outreach. Attendance has been encouraging. Brother Harrys, now located in Huntsville, will be assisting J. Saword and M. Mendez in the Hispanic outreach. The Lord blessed again in March when another woman from Springdale professed salvation. Fresno: The assembly enjoyed visits in recent months from S. Wells and J. Beattie, and more recently from D. Richards who gave us a week on the book of Ruth. Though small, the assembly appreciates being included in the interests of His servants who come this way. Terryville: The saints appreciated the visit of A.J. Higgins and his ministry in four sessions on Christian Living. There was very good attendance from surrounding assemblies. Antioch: R. Orr and J. Portman commenced gospel meetings here March 22, and are continuing in the hall on Sundays through Wednesdays, and in St. Ansgar on Thursdays and Fridays where some of the believers live. Dunkerton: P. Ramsay was with the saints for a week of excellent ministry on the life of Abraham, and for a week of well-attended children’s meetings with lessons from Luke’s Gospel. Garnavillo: J. Portman was with the assembly for four ministry meetings which the saints appreciated very much. Hampton: Meetings which commenced in March with Scott MacLeod and Murray McCandless extended into April. The number of unsaved coming to the meetings was encouraging, and two had professed to be saved at last report. Marshalltown: J. Portman continues to visit each week with Bible studies in homes, some in English and some in Spanish, with some showing good interest in God’s Word. West Liberty: J. Portman, along with others, continues with meetings in Spanish on Friday nights. Methuen: The assembly undertook a gospel effort from mid-November to March in the adjoining city of Lawrence. A rented storefront, designated the “Good News Gospel Center,” was home-base for hosting two holiday give-aways, and distributing gospel texts, CDs, literature, and neighborhood visitation. Gospel sessions, Bible studies, and children’s meetings were held weekly, with the much appreciated help of pre-recorded messages in Spanish by H. Rodriguez. A half-dozen contacts resulted, with a few still visiting the Hall, and interested in salvation. In January, the believers also enjoyed a much appreciated visit by A.J. Higgins, on a series about Bible history and teaching. These sessions are available on the MGH web site. Saugus: B. Lavery visited with ministry from Philippians 3 and 4, linking Old Testament characters with the truths found in these chapters. He also preached the gospel at the rehab center where 17 unsaved individuals listened attentively to how God reached and saved him. Please pray for this work as we continue in our third year, trusting that God will bless his Word and that this door will remain open. Jackson: The assembly enjoyed a week of children’s meetings with Dan Shutt. Please pray for the good number of children, parents, and grandparents who attended nightly and heard a clear gospel message. Saginaw: Dr. J. Dennison (Livonia) and F. Krauss provided excellent ministry at our bimonthly ministry meeting April 5. Bro. Krauss gave two additional nights of ministry the following week and paid visits to the surrounding assemblies. Sherman: The assembly plans a Seed Sower booth at the annual Mesick Mushroom Festival on Mother’s Day weekend. Please pray for suitable weather and interested souls. Fridley: W. Skates and S. Thompson plan to start gospel meetings here on April 5. Kansas City: J. Jennings was with the saints for ministry meetings on February 16-18 and the following Lord’s Day. It was very helpful and encouraging to all that attended. Albuquerque: Wm. Skates and R. Weber were with the assembly for three weeks of gospel meetings in early February. Good interest was shown and one young lady was saved during the last week. Roy returned in March for one week of encouraging ministry meetings. Caneadea: The saints were encouraged with a good turnout for the Sunday School Treat held March 7. The gospel was presented very clearly. Denver: It was the joy of the assembly to receive two young sisters into the fellowship. The saints enjoyed encouraging visits during the month from S. Thompson, J. Slabaugh, and A. Robertson. Akron: J. Slabaugh paid a short visit and gave helpful ministry on Psalm 1. Mansfield: D. Shutt was with us for the March area ministry meeting giving challenging ministry on “The Christian in the Information Age” with it’s possibilities and problems. A good number of believers from surrounding assemblies were present. Steubenville: The assembly enjoyed the ministry of R. Surgenor on the Person of Christ from John’s Gospel. Matoaca: The conference was an encouraging time, with a good number gathered to hear God’s Word ministered by W. Gustafson, A.J. Higgins, D. Oliver, D. Petterson, and A. Robertson. J. Slabaugh visited for two nights in ministry later in the month. LaCross: In March, A. Christopherson had three enjoyable weeks in the gospel sharing the platform each night with men from the assembly. New people attended with good support from the believers. Madison: In June, A. Christopherson will have two nights a week in the gospel, sharing the meetings with local brethren from the area. Ken and Doris Taylor, along with Gaius and Linda Goff, have recently concluded a five week visit to Dominica. The two brethren had a week of ministry with the Roseau assembly at the beginning of their visit, followed by two weeks of gospel meetings. There was excellent attendance by the believers of the five assemblies during ministry meetings and good numbers of unsaved in the gospel effort. Gaius then had a week in the gospel with the Laudat assembly. Local brethren assisted him in opening the meetings. Ken remained in Roseau for Bible readings on the meetings of the local assembly. Help was given to the Christians of the Petite Savanne assembly to plan and initiate the reconstruction of their Gospel Hall. Excellent progress has been made on the project. The men mixed the cement for the floor while the women cooked a large meal for the workers. The concrete block walls are now up and the roof trusses should be back in place within a week. The believers are enthusiastic about having a new building for the furtherance of the gospel and the blessing of the assembly. During February, Brian Owen engaged in ministry meetings in St. Lucia. The four assemblies located in the north of the island hosted the meetings. He had two weeks at Forestierre, one week at Ciceron, and one week at Le Guerre. Howard Pratt (Kirkland Lake) shared with brother Owen for the first two weeks. Herb West (Chapman Valley) shared in the last two weeks. It was very encouraging to see good numbers in attendance each evening. During the month of February and into March renovations were done on the Gospel Hall at Castries. The hall was built in 1980. In more recent years it has become apparent that the roof trusses plus other parts of the building were being eaten by termites. Herb West inspected the hall last year and returned this year to oversee the renovations. Brother Jerome of the Ciceron assembly was awarded the contract to do the work. The brethren are happy with the progress and quality of workmanship, and thankful to our God for meeting all of the financial needs. The saints at Castries are most grateful for all who have had a part in this effort. May 22–24 in the Sarnia Gospel Hall. The conference theme is “The Heart of the Problem is the Problem of the Heart.” The first session Friday night is “Why a conference on the Heart?” – M. Derksen. Following sessions are The Heart of God and Christ – D. Vallance, The Heart of Worship – J. Dennison, The Heart of Joy – S. Vance, The Heart of a Servant – J. Procopio, The Heart of Love – J. Dennison, The Heart of Purity – A. Ussher, The Heart of a Soul-Winner – J. Procopio, The Heart focussed on Heaven – M. Derksen. For more information contact John Prins, Tel: 519 542-8091, E-mail prinsj@sofsurfaces.com. June 6. Ministry 10am, Children’s Meeting 1:30pm, Gospel 7pm. Lunch will be served at 12 noon and supper at 5pm. David Booth, Jim Jarvis, and Bryan Joyce will give ministry as the Lord leads. Inquiries: Luke Winkels, Tel: 519 424-2796, or lukeandgerda@execulink.com. June 6-7, with Prayer Meeting on Friday, June 5 at 7pm in the Gospel Hall. All other meetings will be in the school gymnasium. Ministry meeting on Saturday at 10am. Breaking of Bread on Sunday at 10am. The last speaker on Sunday afternoon will preach the Gospel, and there will be no night meeting. The speakers are D. Shutt, J. Dennison, S. Higgins, and M. McCandless. For further information Call John Kregel, Tel: 563 964-0520, or j_kregel@yahoo.com. June 11-14, sponsored jointly by the assemblies meeting at First Street Gospel Hall and Fifth Avenue Gospel Hall. The Prayer Meeting is on Thursday, June 11, at 7:30pm in the First Street Gospel Hall. All other meetings will be in the William Glesby Centre, 11 – 2nd Street NE. The subject of the Bible readings will be Romans 8. General inquiries: David Vanstone; Tel: 204 857-8435; E-mail vanstones@gmail.com. Accomm: Malcolm Stanley; Tel: 204 857-9074; E-mail mj@thestanleyshouse.com. June 20-21, in the Gospel Hall with Prayer Meeting on Friday, June 19, at 7:30pm. Supper served at 6pm. Saturday: Breakfast 8am, Bible Reading to follow (Philippians 3:7-16 – Christ Gained) , Ministry 10:30am, 2 and 7pm. Lord’s Day: Breakfast 8am, Bible Reading to follow (Psalm 22 – Christ Forsaken) , Breaking of Bread 10:30am, Ministry 2pm, Gospel 7pm. Corr: Ken Stone, R.R. 3, 187 Sandhills Rd., Woodville, ON, K0M 2T0; Tel: 705 374-4688. June 26-28 in the G. C. Rowe Junior High School, with Prayer Meeting on Friday at 7:30pm. Saturday: Prayer/Ministry 10am and 1:30pm, Gospel 7pm, Young People’s 8:30pm. Lord’s Day: Breaking of Bread 10am, Sunday School and Bible Study (John 13) 1:30pm, Prayer/Ministry 3:30pm, Gospel 7pm. Accom: Roy Foster, Tel: 709 634-5022; rfoster@nl.rogers.com, or Bernie Payne, Tel: 709 634-1843; berniepayne2004@yahoo.ca. June 27-28, in the Englehart High School, with Prayer Meeting on Friday, June 26 at 7:30pm. Supper served at 5:30 pm Friday in the school. Times of meetings both days are 10am, 2pm , and 7pm. Corr: Philip Potter , Earlton , ON, P0J 1E0; Tel: 705 563-2942, or Harvey Pratt , R.R.#1 Charlton , ON. Tel. 705 544-7758. June 27-28, in the Gospel Hall, 421 Old Belgrade Road. Friday, June 26: Prayer Meeting 7:30pm. Saturday: Bible Reading 9:30am. Corr: Jim Thompson, Tel: 207 512-2636; jptbooks@gmail.com. June 26-28, with Prayer Meeting, Thursday, June 25 at 7:30pm in the Gospel Hall. Meetings begin Friday at 2pm. Corr: John Parker, Tel: 306 752-4079. July 3-5, in the Westsyde Gospel Hall, 849 Wawn Rd., Tel: 250 579-5850. Friday: Prayer and Ministry 7pm. Saturday: Ministry 9am, Bible Reading 2pm (James 4:13 – 5:20: Planning, Possessions, Patience, Prayer), Ministry 4pm, Gospel 7pm. Lord’s Day: Breaking of Bread 9:30am, Open Sunday School 11:30am, Ministry 2pm, Gospel 7pm. Meals provided Saturday and Lord’s Day 8am, 12pm, 5pm. Corr. and accomm. John Eggers, 3664 Westsyde Rd. Kamloops, BC, V2B 7H6; Tel: 250 579-8814; E-mail: jfeggers@telus.net. July 4-5, preceded by a Prayer Meeting, Friday, July 3, at 7:30pm. Breaking of Bread 10am. Order of meetings as usual. Corr: Harold Elliott, R.R.#1, Wallace, N.S. B0K 1YO; email: wiretrap@ns.sympatico.ca; Tel: 902 257-2236. For advance accom: Jerry Thompson, Tel: 902 243-3112; E-mail: wallwash@hotmail.com. Port Sydney (Deer Lake Gospel Hall): Ben van Noppen, 812 Deer Lake Rd., Port Sydney RR2, ON, P0B 1L0; Tel: 705 385-0268; ben.vannoppen@sympatico.ca. Sarnia, ON: John Prins, 2998 London Road, Sarnia, ON, N7T-7H2. Tel: 519 542-8091, 519 786-2750, Cell: 519 384-8671. West Union, IA (West Union Gospel Hall): Steve Walvatne, 18202 V. Ave., Hawkeye, IA 52147; Tel: 563 578-8505; E-mail: stevewalvatne@hotmail.com. Steubenville, OH: Lord’s Day: Breaking of Bread 10-11:15am; Sunday School/Bible Reading 11:30-12; Prayer Meeting 12-12:15; Gospel Meeting: 12:15-1pm. Weekly Prayer and Bible Reading 3:30-4:45pm. These changes necessitated by deteriorating conditions in the neighborhood of the hall. Mary Evelyn Jones of San Felipe, Chile, on January 9, age 77. Our beloved sister was taken suddenly and unexpectedly as a result of a car accident in Chile where she and her husband David have served the Lord for nearly 50 years. She was born in Vancouver in 1931 and saved as a girl of nine. From early life she was active in gospel outreach in the Skid Row area of the city. She was received into the East Hastings assembly, married David in 1954, and both involved in the Deep Cove work. They were commended by three Vancouver assemblies to the work of the Lord in 1959. She had a tremendous impact on the work in Chile with her personal interest in people, wise counsel to women and young people, and faithfully filling her God-given role in laboring alongside her husband. A large funeral in Chile, and a large memorial service in Vancouver, both with several hundred present, attested to the love and respect for her felt by all. Please pray for brother Jones who continues in the work in Chile. Also for the family circle in the Lord – son David (Elizabeth), daughters Kathy (Norm) McKillop, Barbara (Brad) Little, and Dawna-Lyn (John) Broadhead, and ten grandchildren. Mary E. (Betty) Haack of Waterloo, IA, on March 3, age 85. Betty was saved a week following her husband, on February 17, 1971, during meetings being held by Sydney Maxwell and Eric McCullough. She and her husband were in fellowship at the Western Avenue assembly, where she continued faithful in attendance until illness hindered. Her husband tenderly cared for until she entered a nursing home eight months ago. Her husband, Eugene, survives. E. McCullough, R. Nesbit, and R. Orr shared in the service at the Hall and at the grave. Mark Long of Sarnia, ON, on March 13, age 81. Survived by his wife, Elfrieda, eight children, and several grandchildren. Please pray for his wife, who is in assembly fellowship, and the many loved ones who mourn his loss. Mark often gave out BHB #173 which expresses wonderful truth concerning the Savior he loved. For the past several years, Mark was confined to a local health care facility, and was unable to attend the assembly meetings. His family, many of whom are not saved, heard the gospel faithfully and warmly preached by Jack Nesbitt and Jim Chisholm. Laura Franzen of Clarksville, IA, on March 23, age 93. Our dear sister was saved on March 6, 1941 through the testimony and witness of her sister, Dorothy. The past 25 years she resided in Clarksville and was in the fellowship of the assembly at Antioch. She was respected and an example to all who knew her. Her husband, Matt, preceded her in 1979. Laura had a burden for the salvation of her large family. She was a loving mother to her 15 children, 13 of whom survive, along with their spouses and families. Russ Nesbit spoke a word at the service with Frank Erskine and Robert Orr sharing a part. John R. Craig of Moncton, NB, on March 14, age of 87. He was born in 1921 in Windsor, ON and saved November 16, 1938. John never missed an opportunity to tell others of Christ, and also stood firm for assembly principles. John and his wife, Lillian (Mclean) moved to Moncton permanently in 1974. He will be sadly missed by his wife of over 69 years, his brother, Howard (Doris) Craig of Windsor, daughter Grace (Allison) Morton, son-in-law Andrew Labenne whose wife, Sharon, went to be with the Lord February 2007; also three grandchildren, three great grandchildren, nieces and nephews. He will also be missed by the Moncton assembly. Please pray for those unsaved who heard the gospel preached, and for the comfort of the family. Elizabeth Sluiter of Hitesville, IA, on March 16, age 85. She was saved April 8, 1954, receiving her assurance of salvation through John 5:24. She was in happy fellowship with the believers in the assembly at Hitesville until her passing. Her house was destroyed in the May 2008 tornado, and found in the rubble afterward was a little stuffed rabbit with the word “grace” attached. This mascot became precious to her in the closing days of life and marked her demeanor as a gracious woman. She was preceded in death by her husband, Warner, in 2005, and is survived by three children, five grandchildren, and nine great grandchildren. Eric McCullough, Russ Nesbit, and her son Russ Sluiter shared the service in the hall, with Robert Orr speaking at the grave. Andrew McPhee of Newington, CT, on March 17, age 97. He was saved at age 16 as his mother read to him from John 3. He was in the assembly for close to 80 years, and was faithful to the Lord all his days. He was a respected elder and a unique brother who was easily approachable, and always ready to counsel and guide both young and old among the flock. He lived a full life and was a wonderful example of, and to, the believers in every respect. Always in his place in the gatherings, he took part acceptably right up to the last few weeks when he was hospitalized. He was predeceased by his beloved wife of 65 years, Josephine, in 1999 and in 2005 by a son Skip who also professed. He is survived by his only daughter, Holly Ramsay, who lovingly cared for him along with her husband Donald. He also leaves three grandchildren and six great grandchildren, some of them not saved. The large funeral was taken by Bill Brescia and Matt Brescia, with Frank Tornaquindici at the graveside. He will be sorely missed.